MSSC connectors are designed to work in tandem with Simpson Strong-Tie® BP1/2-3 bearing plates to provide solutions for moment-resisting kneewall lighter-duty applications. Submittal/substitution request for MSSC-KW kneewall connectors for cold-formed steel construction. Tabulated values correspond to maximum connector strength without consideration of serviceability. Designer must check out-of-plane deflections using tabulated rotational stiffness. Uplift may be linearly interpolated for design moment less than allowable. Designer is responsible for anchorage design. Tabulated stiffness is applicable for walls up to 38" tall. For taller walls, the Designer must consider additional deflection due to bending in the studs. Per IBC 2015 Table 1604.3 footnote f, wind load is permitted to be taken as 0.42 times "component and cladding loads" for deflection checks. For IBC 2009 and earlier, the factor is 0.7 instead of 0.42. See Fastening Systems and Direct Fastening for more information on Simpson Strong-Tie fasteners. 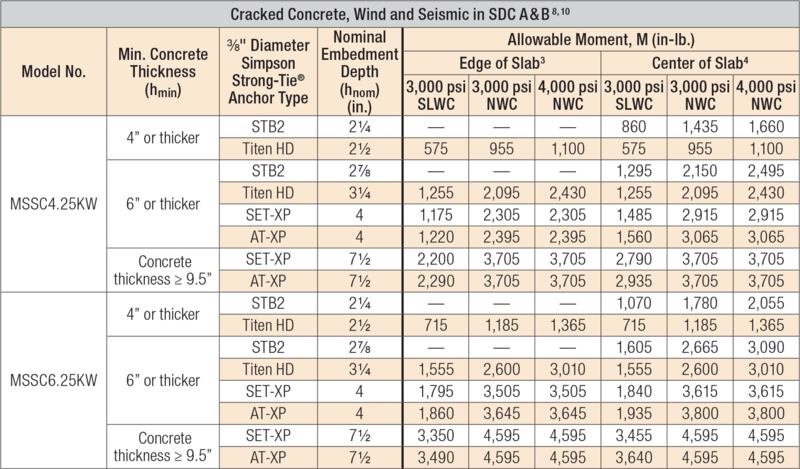 Allowable Moments have been determined using ACI 318-14 Chapter 17 anchorage calculations with the minimum concrete compressive strength, f'c and slab thickness listed. Sand-Lightweight Concrete is abbreviated as 'SLWC', Normal Weight Concrete is abbreviated as 'NWC'. 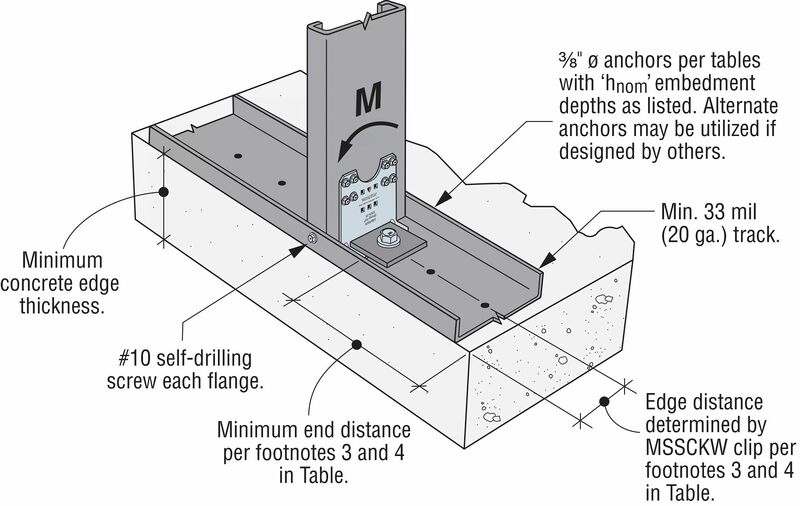 At edge of slab, edge distances are assumed to be 3.0" and 4.0" (1/2 of stud width) as determined for 6" and 8" studs, respectively. 'End distances' are assumed as 1.5 x Min. Edge Distance in one direction and 'N/A' in the other direction. See installation illustration. At center of slab; edge and end distances are assumed as 'N/A' in all directions at locations away from edge of slab. See installation illustration. 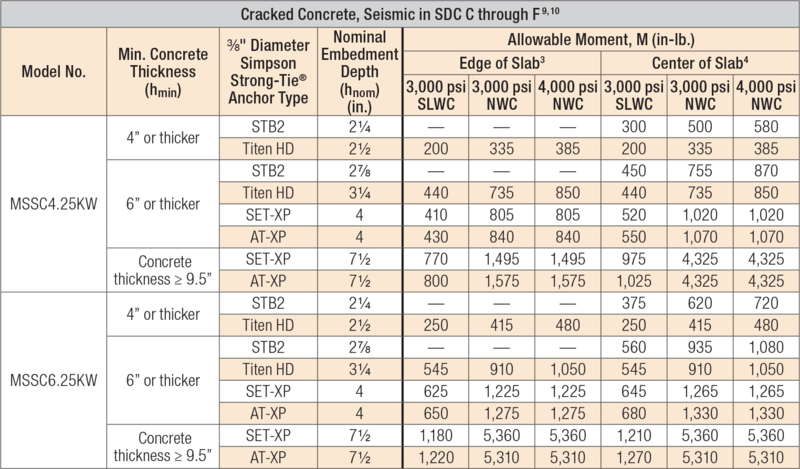 Load values are for a single anchor based on ACI 318-14, condition B, load factors from ACI 318-14 Section 5.3, no supplemental edge reinforcement, ψc,v = 1.0 for cracked concrete and periodic special inspection. Reference ICC-ES or IAPMO-UES evaluation reports for further information. Load values are based on a short-term temperature range of 150°F and 180°F for SET-XP and AT-XP. Long-term temperature range is assumed to be 110°F for both SET-XP and AT-XP. Dry hole conditions are assumed. Other conditions may be evaluated using Anchor Designer™ Software for ACI 318, ETAG and CSA. Allowable Stress Design (ASD) values were determined by multiplying calculated LRFD capacities by a conversion factor, Alpha (α), of 0.7 for seismic loads and 0.6 for wind loads. ASD values for other load combinations may be determined using alternate conversion factors. 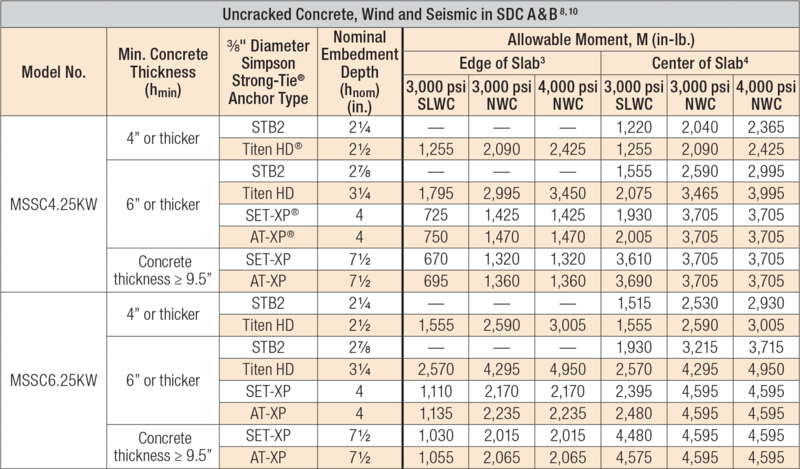 Tabulated allowable ASD loads for Wind and Seismic in SDC A & B are based on using wind conversion factors and may be increased by 1.17 for SDC A & B only. Allowable loads have been divided by an Omega (Ω) seismic factor of 2.5 for brittle failure as required by ACI 318-14 Chapter 17, unless steel failure governs. Tabulated allowable moments are for MSSC Kneewall Connectors attached to studs with 33 (20) or 43 (18) mil (ga.) thickness. Allowable moment may be increased for MSSC Kneewall Connectors attached to studs with 54 (16) mil (ga.) thickness by multiplying by a factor of 1.16 for MSSC4.25KW and 1.28 for MSSC6.25KW. Tabulated capacities assume lateral force applied at height of 38" above concrete. Tabulated capacities are based on maximum allowable anchorage loads only. The capacity of the connection system shall be the minimum of the tabulated value and the allowable load value from the MSSCKW Connectors: Allowable Load Tables. MSSCKW See specific model numbers for code listings.